Along with the post, Mayweather was pictured relaxing on a hammock. An inside source told yours truly just moments ago that the negotiations are moving in a positive direction but that the gut feeling was that it will take between one and two weeks before it would get done. That is, of course, assuming the remaining hurdles are cleared. Often times a fighter grows up in California and fights for his first world title in his home state, or perhaps no farther away than Las Vegas. That certainly was not the case for Randy Caballero of Indio. First he ventured to Japan, where he had to defeat Kohei Oba of Japan with an eighth-round technical knockout in a title-elimination fight in April 2014. Then in October he traveled to Monaco, Monte Carlo and defeated Stuart Hall of England to win the vacant bantamweight world title via unanimous decision. The fun for Caballero is just beginning. On Jan. 22 Caballero and his promoter – Oscar De La Hoya – played host to a news conference at De La Hoya’s Golden Boy Promotions offices in downtown Los Angeles. They were there to promote Caballero’s first title defense, which will come Feb. 27 against Alberto Guevara (19-2, 7 KOs) of Mexico at Fantasy Springs Casino in Indio (on Fox Sports 1 and Fox Deportes). Caballero, 24, couldn’t stop smiling when asked about becoming a world champion. He said things have changed, but he hasn’t. “I go to the store now and people come up and talk to me and say ‘Hi,’ take pictures with me,” Caballero said. “When I go to the mall, everybody’s coming up to me. Other than that, my life is still the same. I’m the same person. I’ve got to wake up every morning and go run and we train every day. Fighters sometimes become complacent after winning a championship. De La Hoya likes the idea that Caballero does not appear to be like that. Although Caballero (22-0, 13 KOs) now lives in Coachella – roughly five miles from Indio – Caballero’s roots are deep in Indio. As cool as it was winning a world title halfway across the world, he expects it will be even better to make his first defense in his virtual backyard. Not if Guevara has anything to say about it. Al Haymon’s “Premier Boxing Champions” series on NBC will debut March 7 and junior welterweight contender John Molina of Covina will take on former three-division champion Adrien Broner (29-1, 22 KOs) in the semi-main event at MGM Grand in Las Vegas. Never shy, Broner was already talking smack during a conference call this week promoting the card, which will be headlined by Keith “One Time” Thurman defending his welterweight belt against former three-division champion Robert “The Ghost” Guerrero. Molina (27-5, 22 KOs) has never won a major title and he won’t be fighting for one in this bout. But a victory could help him land what would be his second opportunity at a world championship; his first ended in a first-round TKO loss at the hands of lightweight champion Antonio DeMarco in September 2012. Molina is a huge puncher and believes he can go right through Broner. Yes, Floyd Mayweather Jr. and Manny Pacquiao did attend the same NBA game this week. Yes, they spoke at halftime. Yes, they met later and spoke for a bit in a hotel. No, they have not made their fight. Yet. … Longtime promoter Cedric Kushner died this week at age 66 from a heart attack. Among the fighters he promoted was former world champion “Sugar” Shane Mosley of Pomona. … ESPN.com reported that former champion Saul “Canelo” Alvarez of Mexico will take on James Kirkland on May 2 at either the Alamodome in San Antonio or Thomas & Mack Center in Las Vegas. The Golden Boy Promotions fight would be on HBO. … Former junior middleweight champion Sergio Mora (27-3-2, 9 KOs) of Montebello on Feb. 6 will take on Abraham Han (23-1, 14 KOs) at Beau Rivage Resort in Biloxi, Miss. (on ESPN2). Middleweight champion Jermain Taylor on Wednesday was booked back into jail after a judge determined he had violated the terms of his release on bail from an August shooting by allegedly pointing a gun at a man’s head and threatening to kill his three children at a parade Monday in Arkansas, the Associated Press reported. Taylor in August was charged with allegedly shooting his cousin in Little Rock, Ark. He was released on bond and then was arraigned Tuesday on these more recent charges. He pleaded not guilty and again released on bond, but a day later a judge said he had violated the terms of his previous release and is now to be held without bail. Taylor was to defend his title against Sergio Mora of Los Angeles on Feb. 6 in Biloxi, Miss., but that has been canceled. Taylor’s moniker is “Bad Intentions.” Seems to fit these days more than ever. 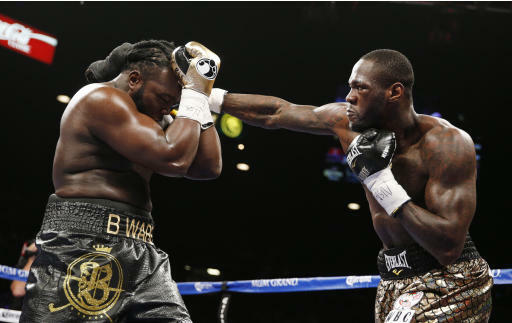 Bermane Stiverne was out-worked, out-boxed and out-punched Saturday night while losing his heavyweight world title to Deontay Wilder at MGM Grand in Las Vegas. Now we’re hearing that Stiverne wasn’t himself because of severe dehydration. He apparently found that out when, instead of attending the post-fight news conference, he went to a local hospital. Keep in mind that Stiverne is a heavyweight, so he doesn’t have to make weight. That makes one wonder how he became dehydrated in the first place. Secondly, as someone who has been dehydrated before, I can honestly say that Stiverne did not look like he was in that condition during the fight. Did he appear tired in the second half of the fight? Of course, he did, but fighters usually do become tired in the second half of the fight. Wilder was, too. Otherwise, Stiverne was fighting hard. Also, a fighter typically becomes more fatigued when he’s losing handily, and swinging and missing. The point being, perhaps Stiverne became dehydrated during the fight. That is entirely possible. But I’m having a difficult time believing he was that way when the bout started. He did not lose this fight because of it, he lost it because he was thoroughly thrashed. It just seems like this is an excuse because he lost by a very wide margin on the scorecards and he wants a rematch. Not convinced? Listen to what his promoter – Don King – said at a news conference Monday in Las Vegas. “We called this press conference because the Bermane we saw on Saturday night was not the Bermane we all know,” King said. “Deontay Wilder did a very good job; this is not a press conference for excuses, it is for fact. The doctors at the hospital … said that he had a severe case of dehydration. His muscles were not working and they thought he had blood in his urine, so they took some tests and held him in the hospital until this morning. I’d say King and Stiverne are doing exactly what King is saying he’s not doing. Seriously, to anyone who watched this fight, did Stiverne look like he was severely dehydrated from the get-go? If so, why was he running his mouth so much? It seems to be that’s the last thing a fighter would do if he felt so poorly. Wilder won this fight by scores of 118-109, 119-108 and 120-107. That’s sheer dominance. Leo Santa Cruz of Lincoln Heights defended his super bantamweight world title Saturday with a eighth-round TKO of Jesus Ruiz of Mexico underneath the heavyweight title fight between Bermane Stiverne and Deontay Wilder. There were no knockdowns, but Santa Cruz was pummeling Ruiz (32-6-5) on the ropes before referee Kenny Bayless stepped in to halt the bout. Santa Cruz is now 29-0-1 with 17 knockouts. Negotiations for a potential May 2 fight between middleweight champion and Miguel Cotto and former junior middleweight champion Saul “Canelo” Alvarez have stalled and been suspended, Oscar De La Hoya said Saturday. According to a report on ESPN.com, De La Hoya – Alvarez’s promoter – called off the talks because Cotto and his team did not meet a Friday deadline to agree to terms. The report indicated the Cotto camp was not happy with the money being offered. 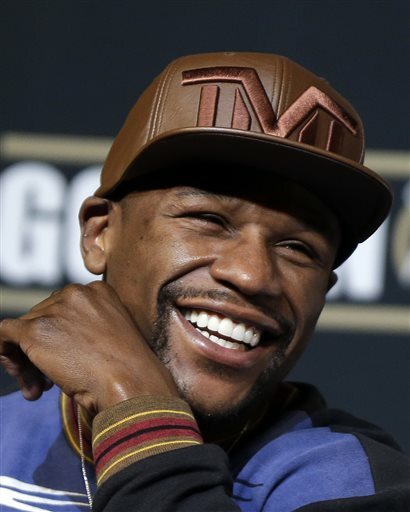 This would seem to open the possibility of a rematch between Cotto and Floyd Mayweather Jr. should Mayweather not sign for the much-anticipated fight with Manny Pacquiao. Cotto lost a 12-round unanimous decision to Mayweather in May 2012 at MGM Grand in Las Vegas. OK, so we’ve heard that Manny Pacquiao has agreed to terms for a long-awaited fight with Floyd Mayweather Jr. that would presumably take place May 2 at MGM Grand in Las Vegas and most likely be available on both HBO and Showtime pay-per-view arms. Mayweather, of course, has not yet done likewise, however, and time will tell if he does. But, really, how can he not? It appears Pacquiao has agreed to drug-testing that would please Mayweather, and let’s face it, it’s now or never. With Mayweather only six weeks from his 38th birthday and Pacquiao 36, this is the last chance for this fight to mean anything. Another year, and it won’t, and you’ll find plenty of people out there who already believe the ship has sailed on this matchup. That said, it will break all pay-per-view records right now. The guess here is that Mayweather is going to wait as long as he can before making the fight official because he likes to bust chops. It was interesting that after covering the Lakers-Miami Heat game Tuesday at Staples Center, talked to Kobe Bryant, who is a big boxing fan. He discussed the fight and then intimated that he knows it’s going to happen. He wouldn’t elaborate. He does know Pacquiao because he goes to Wild Card gym in Hollywood to watch Pacquiao train, so maybe he’s got some inside scoop that an announcement is imminent. Anyway, Mayweather has no reason to turn down this fight. He can continue to negotiate the money, but he’s gotta make the fight, It would be a shame for Mayweather to fight two other guys to finish his career, not fight Pacquiao, and then have his legacy tarnished because of it. Mayweather has had too fine a career to let that happen. Make the fight, Floyd. It’s all on you.